A 24-year-old man will appear in the Magistrates Court today charged with drug offences following a routine search on a bus traveling from Adelaide. Detective Sergeant Dave Hamlyn says drug detector dog Wilson provided a positive result to a bag belonging to the man in Alice Springs yesterday. 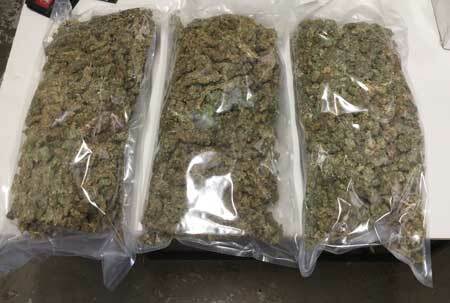 Police seized 1.36 kilograms of cannabis contained in three large cryovac bags (pictured – photo courtesy police). The man was arrested, charged with possession of a schedule 2 dangerous drug and remanded in custody. Meanwhile police are warning NT residences to be wary of a telephone scam claiming people owe the Australian Taxation Office (ATO) money. Detective Senior Sergeant Peter Malley says people are advised by a caller they owe money to the ATO and if they do not pay the money they will be issued a warrant for their arrest. They are also advised to attend the Post Office and put money on a ‘Load and Go’ card to pay the money owed. “You can check whether the person is legitimate by calling the ATO on the official contact number on 13 28 69,” says Sgt Malley.